The ocean is a spectacular place harbouring amazing creatures. Dolphins, starfish, octopus, and lobsters, to name a few. But it is also home to some of the most dangerous sea creatures. Covering roughly 70% of the earth’s surface with around 95% remains unexplored. Most people think that sharks and crocodiles are the most dangerous sea creatures, but there are plenty of other monsters in the ocean. From stingrays to sea snakes, there is no shortage of dangerous creatures that are known for being deadly. These creatures combine aggression, frightening personas, deadly venom, killer instincts, and stealthy camouflage. Since human beings are not native to the seas, we make easy pickings for these hazardous creatures. However, for most of these animals, they present a danger either through a defensive trait, a desire for food or both. Based on extensive research and the latest scientific evidence, this list puts forward seven of the most dangerous sea creatures. Ocean lovers should avoid these animals at all costs. They can cause humans serious pain and even death through their strong bite or a lethal poison. Each thoroughly deserves a place on our list of the most dangerous sea creatures. Stingrays are among the most passive and relaxed marine creatures and hardly get to attack. In most cases, they only attack victims when they are stepped on. They have one or more stingers on the tail which can reach a length of 14 inches (35cm). Their stingers have a venom which can cause pain, trauma, muscle cramps and swelling. In most cases, the attacks are not lethal apart from in some rare fatal cases. A notable case is the tragic death of famed crocodile hunter, Steve Irvin. In an incident in Batt Reef off the coast of Australia, a string ray attacked and pierced the heart of Irvwin. The stinger went through his thoracic wall resulting in massive trauma. Stingrays are mostly found in coastal tropical and subtropical marine waters across the world. The tiger shark is a big predator, capable of attaining a length of over 5m long. It’s dangerous because it feeds on almost everything including fish, birds, seals, stingrays, sea snakes, turtles, dolphins and other small sharks. These blunt-nosed marine creatures have earned a reputation as man-eaters and are only second to great white sharks in attacking humans. They have sharp teeth, excellent eyesight and sense of smell, and powerful jaws. They are common in both tropical and temperate waters. Tiger sharks are a threat to divers, surfers, and swimmers because they tend to be both curious and can be aggressive when they encounter humans in the ocean. Sea snakes include over 40 species that live in the sea and are mostly found in the Indian and Pacific Ocean. They are closely related to land kraits and cobras. Though they have tinier mouths and smaller fangs, their venom is more lethal than their land cousins. The Beaked Sea Snake Enhydrina schistosa is regarded as one of the most venomous snakes on the planet and the Belcher’s Sea Snake Hydrophis belcheri has the most potent venom. Sea snakes are not aggressive and often avoid humans. However, it’s better to avoid them as they can easily bite you even through your wetsuit. This 12-inch fish is regarded as the most venomous fish in the world. Its greatest asset is its camouflaged body that has evolved to look like a rock. Unfortunately, many victims accidentally step upon it and are met with sharp spines that easily pierce their feet. The thirteen spines on its back deliver a lethal dose of venom causing excruciating pain, paralysis, seizures and in extreme cases heart failure. A Stonefish sting can also occur on the beach as they are able to stay out of water for upto 24 hours. The one good thing is that they never try to attack you. Rather they use their venom as a means of defence. Third on the list is the blue-ringed octopus. Despite its small size, delightful name, and beautiful appearance, it is considered one of the most venomous marine creatures. It carries enough venom to kill more twenty people within minutes. Its venom is 1200 times more toxic than cyanide and results in paralysis and respiratory depression. Its bite is usually small and painless so it is hard to realize when you have been bitten. Its first instinct, when faced with danger, is to flee but it can go into defensive mode and show its blue rings when confronted. They are mainly found in Australia and the borders of the Pacific and Indian Oceans. Stretching up to 20.7 feet (6.30 m), the saltwater crocodile is the largest reptile in the world. It has the most powerful bite with a jaw strength 10 times stronger than that of the great white shark. They are lethal on both land and sea and can swim at a speed of up to 18mph. While they are not as fast on land, still beware as they can attack in an explosive manner that catches many of guard. Though mostly associated with Australia, the species is also found in other regions such as Southeast Asia and eastern India. In Australia, research shows saltwater crocs are responsible for two deadly attacks every year. The number is believed to be much greater worldwide as many cases going unreported in underdeveloped countries. Box Jellyfish, also known as marine stingers and sea wasps, are considered the most dangerous sea creature and most toxic animal on earth. According to National Geographic, its venom contains toxins that attack the nervous system, heart, and skin cells. If you come into contact with the venom, you can experience cardiac arrest, paralysis and even death. While most species are found in warm tropical and subtropical oceans including Japan, the east Pacific Ocean, and the Atlantic Ocean, the most lethal species are largely restricted to the Indo-Pacific region. 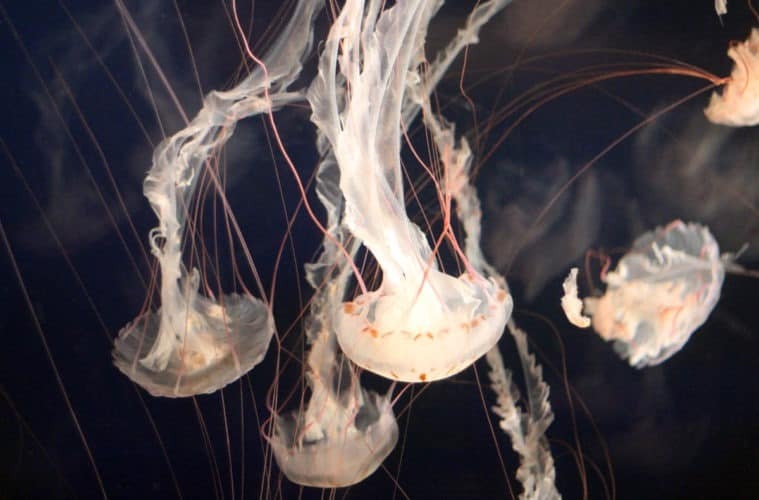 In Australia, the Box Jellyfish has caused more deaths than snakes, sharks, and saltwater crocodiles combined. This makes it the most formidable contender in our list of the most dangerous sea creatures. In conclusion, most of these dangerous sea creatures only attack humans when provoked, though others such as the tiger shark attack humans due to their aggressive nature. Divers, surfers, anglers and swimmers should take the necessary precautions in the oceans to avoid encountering or provoking these dangerous creatures. This article is by no means designed to scare or discourage you from fishing, diving or surfing in the open ocean but rather to inform you of the risks so you can take precaution. When you venture out into the sea make sure you know the risks and are aware of the creatures that are encountered in the area. Avoid disturbing any sea creature, obey all warnings and postings, and seek immediate medical attention in case anything happens. So, do you agree or disagree with out list of the 7 most dangerous sea creatures? Let us know in the comments below.